Are you a 90s kid?! Set your AIM status to away and pump up your sneakers because this party is going to be DA BOMB! Sing and dance to your favorite songs from the 90s as Zoodust takes you on the nostalgic trip of a lifetime! 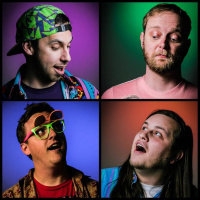 You'll feel like you're back in the 90s as Zoodust plays songs from bands like Third Eye Blind, Backstreet Boys, Weezer, Sublime, NSYNC, Spice Girls, Sugar Ray, Britney Spears and PLENTY more. Want to perform in our ballroom? Sounds Like Fun - Charades Tournament At Highball! The date got moved but the fun is still on the way! Your Mon-Thurs evenings are about to become FABULOUS! HIGHBALL KARAOKE LEAGUE IS BACK! Wait... when does this thing start? With an experienced team of event planners and caterers on staff, The Highball and the Alamo Drafthouse's private events team can help you plan your next meeting or event. Types of events we specialize in include corporate daytime meetings and team building outings, customer appreciation events, holiday parties and more! The Highball is also available for weddings, rehearsal dinners, receptions, fundraising events, fraternity and sorority events and for any type of event you'd like our assistance in planning and coordinating! Contact us today for more information.